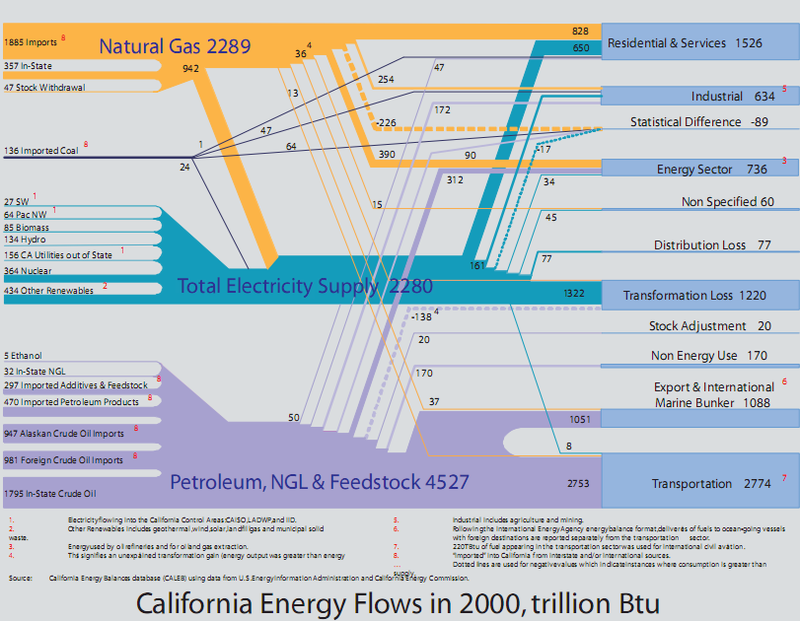 Reading from left to right, the figure shows all the inputs of primary (and imported secondary) energy into California’s economy in 2000. 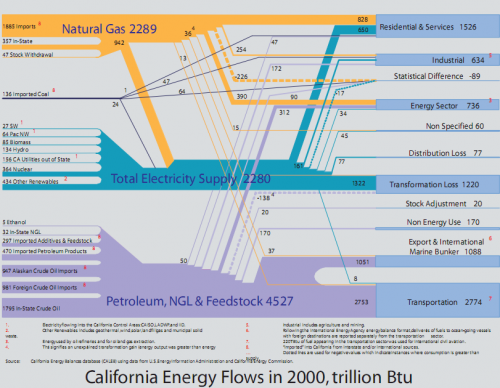 These are summed by major fuel types in the middle of the figure: petroleum and associated products, natural gas, and inputs to electricity generation. The right-hand side shows how all of the fuels are allocated to the various end uses. The executive summary explains that the diagram shows some peculiarities for ‘Arnieland’ compared to other states. It also points out that further research is needed to collect more data and to be able to break down aggregated energy data. This way of presenting the energy balance seems to develop as a kind of standard for representing energy flows for a state or country. Other examples can be seen here: Japan, Scotland, U.S., or Sweden. 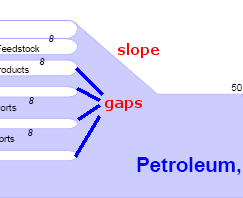 Firstly, it shows negative flows as dotted Sankey arrows, indicating “instances where consumption is greater than supply” – something which on a physical level is of course impossible, but is explained with statistical differences and “unexplained transformation gain … in petroleum refineries” (NB: I would prefer to read “data inconsistency” here). Secondly the breakdown of primary energy and imported secondary energy (input from the left) is fanned out leaving gaps between the arrow lines. The merged arrows are then “condensed” to be to scale again. This creates a 45° gradient at one side of an arrow section (or “slope” for those of you who are into winter sports). In these sections the arrow width can not be proportional to the quantities. A tribute to pay for better legibility of the diagram.